I am a person who doesn’t enjoy the typical saas-bahu series on TV. I just can’t deal with the overacting and makeup laden leads. I personally prefer shows that are more relatable. But at the same time, I am not into serious stuff. Hence, I was looking for a fun show to watch online when I came across Babbar ka Tabbar on ZEE5. With this show, I finally found something that was both relatable yet incredibly funny. The series revolves around Punjabi family who is struggling to maintain their sanity due to everyday issues. The cool guy Anshuman Jha is the sutradhaar who bridges the gap between the kids and their parents. This guy has got a solution for everything. Apart from him, the show consists of a ‘trying hard to be cool’ father, socially-awkward son, overconfident daughter and an over-protective mother. All the unique characters come together and entertain you to the core. The show reflects the generation gap in a witty way with situations where you can relate to your own everyday life struggle. I can watch the show Babbar ka Tabbar back to back. It’s like the perfect stress buster. The best part is you can watch it with your family and everyone will love it to the core. My personal favourite among the characters in the show is the tenant Jamia. Anshuman Jha does look like the quirky saviour we have in our friend circles. He has the best possible solution for almost all the problems occurring in the life of the Babbar family. My second most favourite character would be the over-protective mother and the cute overconfident daughter who keep the gags going, along with Jamia. The show has all the fun elements which will shoo away your stress. The content is fresh and mostly relatable to all age groups. Finally, we have a show where we don’t need to deal with the typical plot of killing the leads and the vamps. Truth be told, the show is the perfect portrait of old-school parenting and millennial child and how their clashing lifestyles drops them into unique situations. 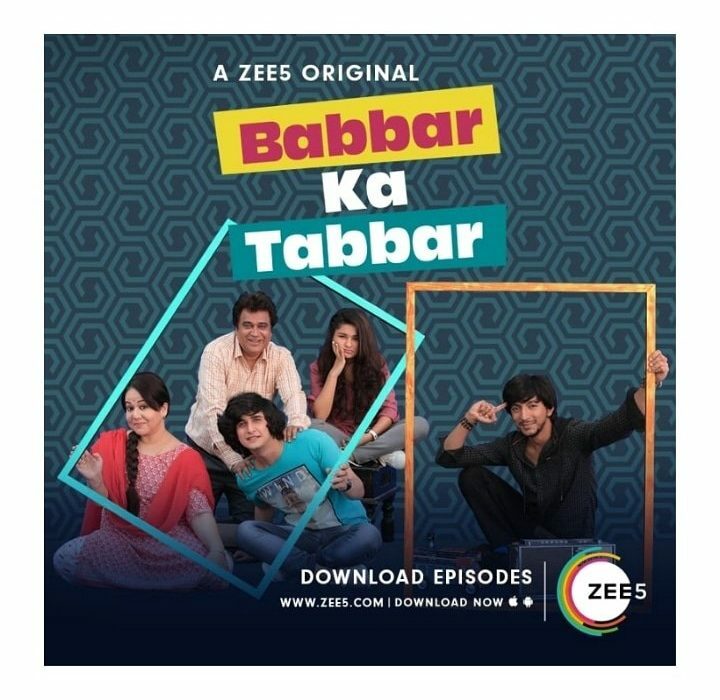 Babbar ka Tabbar is an original series that is available to stream on ZEE5. This show is a mass entertainer and will surely be loved by everyone. I loved Season 1 and going by the trailer, Season 2 sure looks fun too. The subscription for ZEE5 is pretty light on the pocket too. I got the ZEE5 2 months for only INR 99. That’s like cheaper than a movie ticket, that gives us access to its massive library of great content across different languages. So, I would definitely suggest you give it a try and decide. If you are looking for a light-hearted fun show, Babbar ka Tabbar on ZEE5 is the perfect family entertainer, I bet you will have a gala time watching the show. In today’s date there in not much left in the entertainment world that can be Watched with the family. This seems to be a perfect family comedy… At least some good time to be spend together that way. Family Entertainer shows/serials are good and happy to watch with family and children ulike dramatic serilas and shows. Seems to be an interesting punjabi family show. Will watch it soon. Love to watch punjabi family drama,thanks for the intersting post ? Love to watch this show… Superb comedy… ? Really a Good show to be… Thanks there will be something on tV which we all can enjoy together with our family…. This is very good serial.full family enjoy this serial.all caretor are good.really best comedy serial…. This is a super fun show . I am a big fan of series 1 and can wait to see the next series. I love the character of avneet , she makes me laugh. Looks like i should watch this one! Seems a good entertainer !! Zee5 is amazing. They have like everything, thriller, comedy,emotional story, drama all the masala of entertainment. Loved it. Will watch this one too. I loved this show, I personally have watched almost all of its episodes and they were super fun and relatable. I have not watched much Punjabi movies or teleworks but it it surely sounds nice. Would watch it for sure. Thanks for the lovely review and all the details. I haven’t watched this show till now but it seems like a fun show to watch. Will check out zee5. Zee5 is amazing app to see nice shows and movies. I haven’t watched this show but gonna see looks amazing. I am always on a lookout for light hearted shows that can shoo away the stress. This one definitely seems interesting and fun too. This seems like a family entertainment and it’s v rare these days. Such shows used to be a Shan of 90s. Happy that such content is back . Zee5 and it’s shows are already talk of the town. Babar ka tabbar is a comedy show as I understand from your post is filled with humorous elements and so all I can say that my son & husband will love this show.